The floating laboratory will help scientists study fish habitats. The Sir John Franklin was unveiled in North Vancouver on Friday. The first ship built under Canada's new national shipbuilding strategy has launched. Sir John Franklin, or Offshore Fisheries Science Vessel 1 (OFSV1), was unveiled in North Vancouver on Friday. The 63-metre vessel will be used to study the health of fish stocks and their ocean environment by the Canadian Coast Guard. It was designed and built by B.C. 's Seaspan Shipyards, which shared a timelapse video of the massive project on the company's website. Offshore Fisheries Science Vessel #1: August 2015-February 2017 from Seaspan on Vimeo. "The launch of this vessel is the first of many, and signals to the rest of Canada and the world that B.C. is ready and capable to take on large scale projects and produce state-of-the-art vessels," said B.C. Jobs Minister Bruce Ralston in a release. Its namesake is a 19th century explorer who vanished along with 128 members of his crew on an expedition to traverse the Northwest Passage. HMS Erebus and HMS Terror were lost under the ice until Canadian search teams rediscovered the ships in 2014 and 2016. 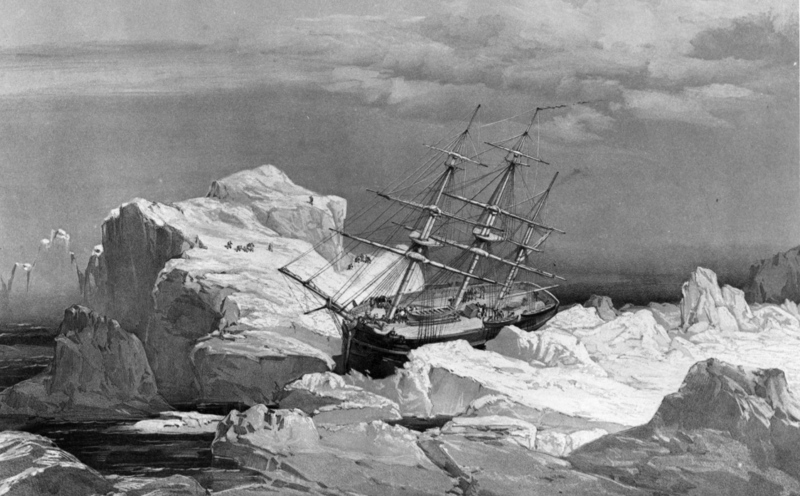 The HMS Investigator — sent dispatched on the search for the doomed Franklin Expedition — is stranded in ice on the north coast of Baring Island in the Arctic in a 1851 drawing. The Sir John Franklin was the first major launch in a program that began in 2010 to revitalize Canada's shipping industry. The three-part national strategy involves the government partnering with Irving Shipbuilding in Halifax and Seaspan in Vancouver for a total of $33 billion in contracts to build large sea vessels, investing $488 million on small ships for the Coast Guard and a mandate to repair and maintain Canada's current fleet. In September, The Canadian Press reported that the ships had suffered a slight delay, with the slow launch of the science vessels pushing back the completion of scheduled icebreaker and navy resupply vessels. "We went from no shipbuilding in Canada, to having an ecosystem around us and capability here at (Vancouver Shipyards) that supports four programs in parallel in that five-year time frame,'' said Brian Carter, president of Seaspan, to The Canadian Press at the time. Ottawa has estimated that the contracts will contribute $7.7 billion to Canada's GDP and create 7,350 jobs per year until 2022.